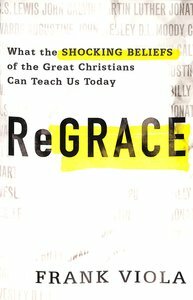 About "Regrace: What the Shocking Beliefs of the Great Christians Can Teach Us Today"
:The church is tired of seeing Christians act ungraciously toward one another when they disagree. Social media has added to the carnage. Christians routinely block each other on Facebook because of doctrinal disagreements. The world watches the blood-letting, and the Christian witness is tarnished. But what if every Christian discovered that their favorite teacher in church history had blind spots and held to some false--and even shocking--views? Bestselling author Frank Viola argues that this simple awareness will soften Christians when they interact with each other in the face of theological disagreements. In Regrace, he uncovers some of the shocking beliefs held by faith giants like C.S. Lewis, Luther, Calvin, Moody, Spurgeon, Wesley, Graham, and Augustine--not to downgrade or dismiss them, but to show that even "the greats" in church history didn't get everything right. Knowing that the heroes of our faith sometimes got it wrong will empower us to treat our fellow Christians with grace rather than disdain whenever we disagree over theology. Frank Viola is an influential voice in the contemporary house church movement. For the last twenty years, he has been gathering with organic house churches in the United States. Frank has written eight revolutionary books on radical church restoration, including Gods Ultimate Passion, Rethinking the Wineskin, Who is Your Covering?, Pagan Christianity, Gathering in Homes and The Untold Story of the New Testament Church. He is a recognised expert on new trends for the church, holds conferences on the deeper Christian life, and is actively engaged in planting New Testament-styled churches. His Web site, frankviola.com, contains many free resources designed to enrich the spiritual lives of Gods people. Frank and his family live in Gainesville, Florida.